For years the Razer Deathadder was the perfect mouse for me in terms of comfort and performance. But over time the Razer software has gotten incredibly bloated, buggy, and downright unreliable. After a botched firmware update bricked my Razer Blackwidow v2 keyboard, I decided it was time to replace my peripherals. Having just switched to SteelSeries Arctis Pro, I already knew their software was top notch. Now I had to find the perfect mouse to match. While I use the Sensei 310 for my day to day work, when it comes to gaming it lacks the comfort required for extended sessions. So I called up the Amazon Fairy and ordered the Rival 310 and Rival 600. Both mice are very similar in specs, with the shapes and features being slightly different. 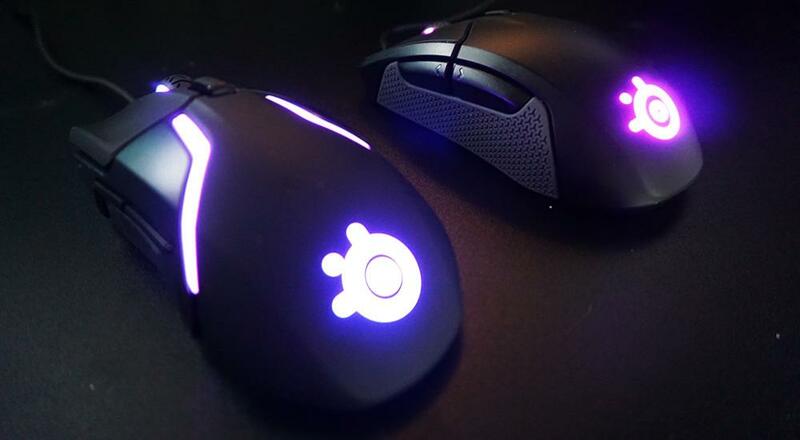 The Rival 310 will you up to 12,000 CPI (counts per inch) with 6 buttons, LED lighting, texture rubberized grip, and what SteelSeries calls their TrueMove3 sensor. On the flip side the Rival 600 offers the same sensor and adds in a weighting system, slightly larger design, and soft silicon feel. There's also an additional optical sensor used to detect lift and further smooth out tracking. I'll be honest, right now I game more than I care to admit in Fortnite, so that's primarily where I compared these two. But I did give them a fair shake in Earthfall, Battlefield 1, and SpaceHulk: Deathwing. Honestly in terms of performance I felt both excelled, feeling on par or better to the Razer mouse I was used to. Tracking was always smooth, the button clicks felt solid, and I never felt like I was fighting to aim in any of the games. For me it comes down to comfort and the Rival 600 is just a more comfortable mouse. It's something about the angle of the Rival 310 that causes my ring and pinky finger to feel smashed together after some time. With the wider buttons of the 600 my ring finger rests on the mouses edge with my pinky on the side. These nuances depend on your grip style, a claw vs a flat rest - something SteelSeries actually details on their site as to which mice work better for which grip style. The Rival 600 does have a more plastic like feel compared to the 310, mostly because of the removable panels for the weight system mean it's not a solid molded body. Speaking of, I don't know why you'd want your mouse to weigh more - unless you are prone to lifting it constantly? Either way I kept mine empty and liked it that way. I lift enough weights when I exercise, I don't need to do it while gaming too. The SteelSeries Engine 3 shines here as a piece of software, offering tons of customization and tweaks in a simple interface. Having both mice plugged in at the same time wasn't even a challenge! I could control the individual profiles on each mouse with two CPI sensitivity settings that could be set and swapped on the fly with a button. You can change lift distance, acceleration and deceleration settings, and even adjust polling rates of the mice. Of course there's also illumination settings to control those fancy LEDs, or you can let the software sync the colors and effects across all your devices. Perhaps my favorite feature is the ability to save each profile out and then apply them when you launch a game. You can configure these for your keyboard, mouse, and headsets. It's super easy to setup and really effective. Being able to have per game settings for CPI, audio profiles, and of course keyboard settings is really handy. So at the end of the day I settled for the Rival 600. It was simply more comfortable for me. Honestly both are great mice and if the Rival 310's form factor is more your style you'll get a ton of great gaming out of it. 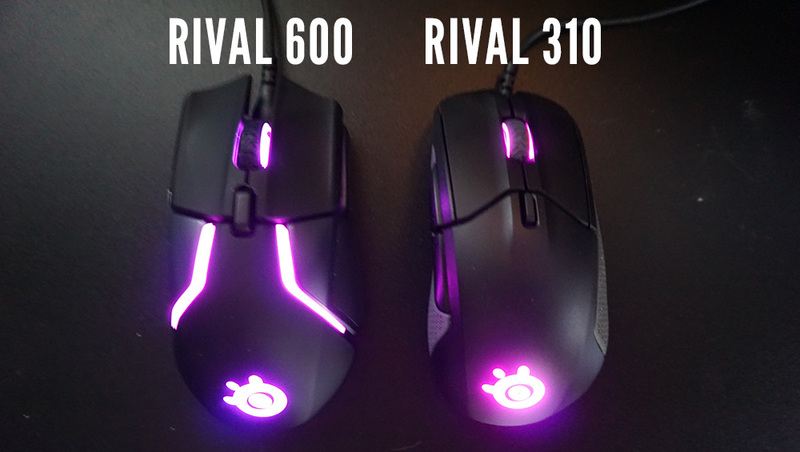 The Rival 310 lists for $59.99 while the Rival 600 lists for $79.99. But amazingly, right now you can snag the Rival 600 for $49.99 on Amazon which is a killer deal. Especially since the 310 is selling for $54.99. Page created in 0.6433 seconds.